Specialist keyworkers for people with mental health problems and learning disabilities in Sheffield have teamed up to host a Christmas event aimed at helping individuals find their vocation. Big Ambitions and Mencap will be co-hosting the event on Thursday 13th December between 12pm-2pm at the Exchange Brewery, 2 Bridge Street, Sheffield, S3 8NS. Look no further ! Our very own Sheffield Voices learning disability group has launched a new fundraising Christmas card ( see picture ) featuring a festive drawing by members of the group with the message: ‘A time for happiness, time for friendship, a time for loved ones. Happy Christmas for all.” Very festive ! Look no further ! 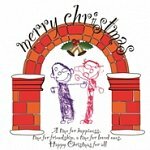 Sheffield Voices learning disability group has launched a new fundraising Christmas card ( see picture ) featuring a festive drawing by members of the group with the message: ‘A time for happiness, time for friendship, a time for loved ones. Happy Christmas for all.” Very festive!